The C strncmp function is one of the String Function, which is used to compare two strings. Or it is used to check whether those two strings are equal or not. strncmp function uses third argument to limit the comparison. It means, instead of comparing whole string, you can compare first four characters, or five characters etc. In this article we will show you, How to use strncmp in C Programming language with example. The basic syntax of the strncmp in C Programming language is as shown below. n: The maximum number of character that you want to compare. TIP: You have to include the #include<string.h> header before using this strncmp string function. The strncmp function is used to compare user specified string with existing string for n number of characters. This program will help you to understand the strncmp with multiple examples. This will compare first four characters because, third argument is 4. This statement will compare first six characters because, third argument is 6. This program allows the user to enter two strings. 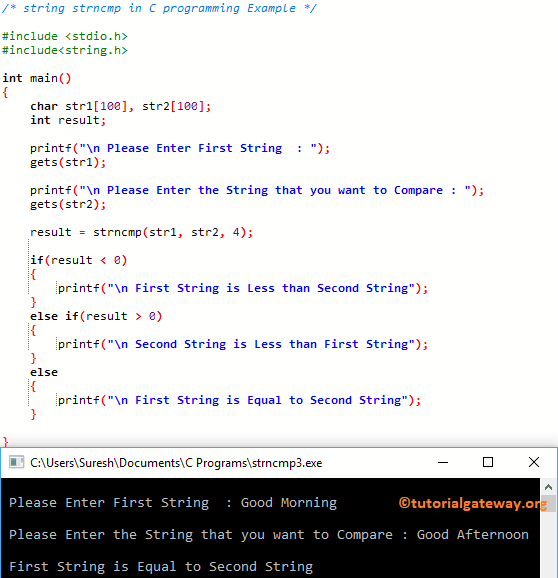 Next, it is going to compare those two strings using strncmp function in C programming.